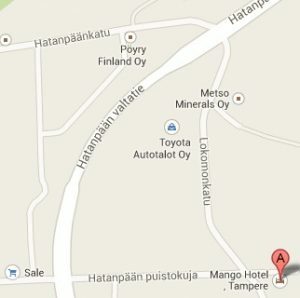 Mango Hotel is located in Hatanpään puistokuja 36 and it has excellent connections to the city centre, 5 minutes’ drive from Tampere Train Station, walkable distance to business area like Metso Minerals Oy, NSN, John Deere Oy etc, as well as to the Tampere – Helsinki motorway and Tampere airport. To City center: There are two bus stops that are situated at a walking distance from Mango Hotel. To Tampere Railway Station: All the buses mentioned above go to city center and from there, the railway station is about 2 minutes away. Taxi: Taxi is available right in front of the airport. Taxi: Taxi is available right in front of the railway station. Walking: It is 1.9 km form railway station.